Swierczynski is one of those rare novelists who have yet to make a misstep in his career, despite the broad narrative leaps he takes. His novels are—for a lack of a better term—high octane thrill rides, which constantly challenge the notions of genre and keep the reader burning through pages. 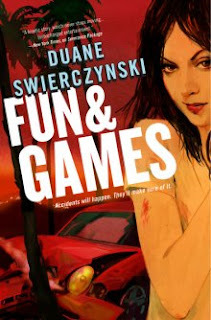 Swierczynski is also one of the novelist who I’ve most wanted to interview and finally I was lucky enough to sit down with Duane at the Poisoned Pen Bookstore in Scottsdale, AZ where he was making his first appearance and we sat down and talked about his latest effort Fun & Games, Mulholland Books, his recent work with DC comics, and just where in the Hell he gets ideas from? Oooh. Whetting my appetite for tomorrow night. Hi Duane, thanks for giving us a look at the formulation of the book. I loved this interview. Duane Swierczynski is one of the nicest guys out there. I agree with Keith about the awesome trilogy. Thanks for the interview. Keep the scissors away from Swierczynski! Keith, You're lucky he didn't gut you. The last guy who interviewed him hasn't been seen (found?) since. Fantastic interview, Keith. Next time you'll remember to hide the sharp objects. You always pick such interesting! I have not seen this one and now feel I must do so soon. Loved your description of it. Thank you for picking this one. Day Labor is the official news blog of Crimefactory magazine. Crimefactory volume 1 was originally established in 2000 by the legendary David Honeybone. Volume 1 sadly came to a close in 2003. In 2009, Melbourne based writers Cameron Ashley and Liam Jose, and Arizona based writer Keith Rawson resurected Crimefactory volume 2! Since re-establishing the magazine, Crimefactory has become the foremost publication of Noir and Hard-boiled crime fiction, publishing both new and established writers.